Have you ever dreamed of being a princess? How about being a princess in France? What about being the daughter of Marie Antoinette, one of “Children of France”? It seems like a pretty good life, especially if your life is not exactly one of wealth and leisure. Isabelle doesn’t know much about the queen or wealth or leisure. Isabelle is a lacemaker. You might think that that too, sounds like a pretty good job, especially if you knew that she lived in the town of Versailles, France location of one of the world’s largest palaces and home to the kings of France. You’d be wrong. Making lace was mentally and physically exhausting. It was painstaking, tedious work that allowed for no mistakes. The women in Isabelle’s family had been making lace for petty aristocrats for generations. Isabelle hates making lace. However, her father is dead, her brother works and lives at the palace stables, her grandmother is old and her mother crippled in her hands and joints so someone has to earn enough money to keep the family fed and with a roof over their heads. Then one remarkable day, Isabelle’s life is turned upside down. Out of the blue, there is a summons to deliver lace to the palace. Her brother takes her as far as he is allowed to go. Once, inside, lost and bewildered by the chaos that is everyday life at the palace, Isabelle suddenly finds herself pushed to the floor looking up at—The Queen. And so begins her odd association with the family of Louis XVI, in particular with the princess, Therese, as her companion and royal playmate. As her life at the palace becomes more extravagant, without her help, life in her village home begins to rapidly deteriorate. It is this duality that eventually causes Isabelle to question how some of the French people can be cold and starving, while others live only to celebrate the artificial abundance that surrounds them. Isabelle is torn between discontent and loyalty, revelry and revolution. To her credit, the author does not create a neat conclusion. The French Revolution wasn’t pretty and though Isabelle lives to tell her story, there is no Cinderella ending here. That is not to say though, that the story is tragic and depressing. This particular era is not the topic of many children’s historical novels. Readers who enjoy history told from a personal viewpoint will enjoy meeting Isabelle and sharing her experiences as a “pet” of Madame Royale, Marie Antoinette. I know what you’re thinking. Faeries? Little fluffy, dainty, sickly-sweet little things who twinkle around the ethereal forest chatting with the cherubic woodland creatures? Yeah, that’s what I thought, too. I have nothing against twee fairies (though I’m slightly irked by alternative ‘magykal’ spellings like ‘faerie’ and ‘faery’ and ‘fayrie’ and all of that), but I don’t usually feel the need to read a 400-page novel abou them. Thus, I completely ignored the myriad excellent reviews I had read of Faeries of the Dreamdark: Blackbringer. Last week I had nothing to read and, in a moment of seredipity, found Blackbringer on the new book shelf. I figured that I could put it down again if I didn’t like it. Within 10 pages I was hooked. These are not fluttery glittery fairies. There are a few with swallowtail butterfly wings, and several who are pretty, but they’re all intelligent, resourceful and, in some cases, warrior-fierce. Magpie Windwitch is the granddaughter of the west wind, the daughter of traveling scholars, and a hunter/adventurer seeking out the demon ‘snags’ who have infiltrated the human and fairy worlds. When she discovers the Blackbringer, the scourge of creation, has been freed by some unthinking human fishermen, only Magpie has the skills to find the creature and make the world safe again. If you’re looking for an adventure with danger (the end of the world! ), excitement (an evil queen! ), great characters (imps and dragons and long-dead champions!) and humor (a company of bumbling thespian crows! ), this is the book for you. I promise to return my copy very soon. One of my favorite stories to share is Shark in the Park. Timothy Pope has just received a brand new toy – a telescope! He can’t wait to test it out, so he heads right to the park. What he sees gives him quite a surprise. A catchy refrain and die-cut holes that give children glimpses of what Timothy sees through his telescope make this story even more fun. They’ll laugh as they guess and discover what each item is that Timothy sees. The last page holds another surprise and leaves kids wondering just what might be in the park after all. Unfortunately, only the ducks know. A great story to share during the summer or any time of year for that matter! Mercy Watson is just your average pig except for a few things: she lives inside and sleeps in a bed, and she loves hot buttered toast. One evening after Mercy has been tucked into bed, she hears a noise down in the kitchen. Thinking that Mrs. Watson was maybe making some hot buttered toast, she trots downstairs. But there was no toast, only a thief, so Mercy goes back to sleep. Now the thief could have snuck by Mercy, but as he has doing so, he pops a piece of buttered candy into his mouth while making his getaway. Mercy smells it and decides it must be hot buttered toast. She of course tries to find the toast while the thief tries to escape. Hilarity ensues until the thief is caught. Mercy becomes a hero, and everyone has hot buttered toast. The Mercy Watson books are wonderful for kids just starting to read chapter books. They are funny and entertaining and have great illustrations by Chris Van Dusen. They are perfect in length and vocabulary used and will be a sure hit with early chapter book readers and their parents. Would you rather spend a week with your overly strict aunt or figure out a way for you and your two sisters to just stay alone at your summer home on an island while your parents are away for the week? When Allegra and her sisters worked out their plan they thought they wouldn’t have “a worry in the world.” How wrong could they be? The worries they did have are humorous to read about as one problem after another develops and survival rather than fun becomes the priority. Be glad you are reading about it rather than trying to survive it. In keeping with our summer reading club theme, I decided to write about one of my favorite picture books about alien visitors to earth. Shirley has invited all of her relatives for a summer barbeque and her husband Moe is mowing the lawn when a flying saucer lands in their yard. When the hatch opens and two little aliens who look like bugs in helmets come out, Shirley lets them use the bathroom and invites them to dinner. Moe is hysterical. Moe secretly calls the FBI while Shirley prepares for the party. I will keep you in suspense as to how the dinner goes, but it is very funny and very sweet. I just love the illustrations. David Small wrote and illustrated the picture book Imogene’s Antlers and illustrated The Gardener and The Library , books written by Sarah Stewart. Company’s Coming is suitable for children ages 5 through 8 years old. I have used The Library for brownie groups. Under the heading of “who knew”—or for that matter, who’d ever even thought—come two interesting new non-fiction books. They’re both short biographies, kind of, because one is about an elephant, but they have lives too, don’t they? And both fall into that “Gee, I’m glad to know about this” category. They’re the kind of books you didn’t know you wanted to read until you were finished with them. Buckley’s Just for Elephants is an amazingly touching book about Shirley, an elderly, crippled elephant, who after years in a zoo is transported to an elephant sanctuary in Tennessee. That’s right, there are elephants roaming the rolling hills of Tennessee. They’re under the watchful care of Carol and her partner Scott Blais at their Elephant Sanctuary. Extraordinary. Even more extraordinary is the tale of an old, lonely elephant and how she is reunited with a long lost friend from her earlier circus days. Kindness and friendship—on the part of both animals and humans—just radiate through the entire story. From the wonderful photo on the cover to the notes about the sanctuary at the end, this simple, straightforward book with spare text and almost candid photos is for anyone who has ever loved an animal. 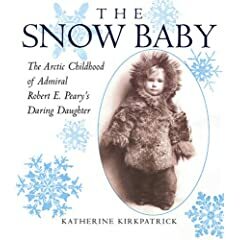 Taking place on the other side of the world, Snow Baby is the tale of not only a brave Arctic explorer, Admiral Robert E. Peary, but of his equally—maybe even braver–wife and their daughter, Marie. How many women in 1893, even now for that matter, would, when they were pregnant, give up a life of ease and leisure to live in a two room hut near the Arctic with a nurse and twelve other explorers? That was Josephine Peary, wife of the explorer and mother of Marie. Her only regret was that she forgot to bring a broom so that she could sweep every now and then. No wonder Marie grew into such an exceptional child. The apple doesn’t fall far from the tree. The book written in an easy to read, chatty manner and tells of Marie’s unusual childhood spent both in a large, comfortable home in Washington, D.C. and on board sailing ships headed for the frozen north. The winter after her seventh birthday, Marie and her mother—along with the rest of the ship’s crew—became shipwrecked. They were “prisoners of the ice. The long, intensely dark, and biting Arctic winter was upon them.” They weren’t going anywhere for a long time so what did Marie do? She helped to build igloos, played with native children, learned to speak the Inuit language and played practical jokes on the ship’s crew. To her way of thinking, there was never a dull moment.